Coverage from $100,000 to $1,000,000, depending on age. A maximum benefit of $50,000 or $100,000 is available for purchase regardless of age. For those up to age 79, maximum limits are from $50,000 to $1,000,000. The plan also includes a Non-Emergency Medical Evacuation benefit. With our other travel plans, Emergency Medical Evacuation dictates that loss of life or limb must be eminent if not treated within 24 hours. Under this benefit, the medical condition doesn’t need to rise to that level. Medical Evacuation is recommended by the attending physician. * Don’t qualify? Need another option? Travelers 80+ can still get $50,000 in coverage. 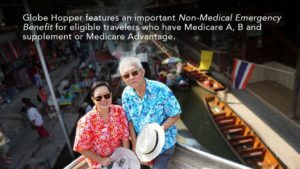 IMG GlobeHopper Senior Travel Medical Insurance - Who is it for? IMG developed this affordable travel medical insurance to bridge the gap left by other limited domestic plans that do not cover seniors when they leave the U.S.
GlobeHopper Senior Single-Trip helps protect travelers who need travel medical insurance coverage from five days up to 365 days while on a single trip. You can also choose from a wide range of deductibles, several Maximum Limits, and you have access to more than 17,000 providers through our International Provider AccessSM(IPA) when traveling and requiring treatment outside the U.S.